Facebook is now offering “Login Approvals”, that is a new way to make your account more secure from unauthorized access to your account. 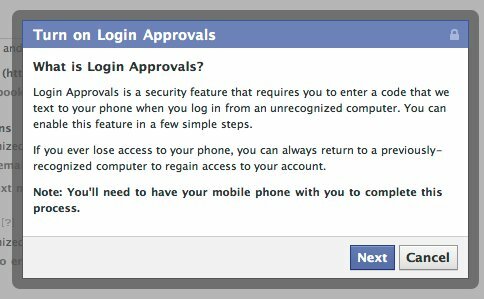 Login approvals is a Two Factor Authentication system that requires you to enter a code we send to your mobile phone via text message whenever you log into Facebook from a new or unrecognized computer. Once you have entered this security code, you’ll have the option to save the device to your account so that you don’t see this challenge on future logins. To turn on Login approval on your account, login to your Facebook account, click Account at the right top corner and then go to Account Settings. Click Change next to Account security option. Check the box under Login Approvals and then follow the on-screen instructions to set-up your mobile. 0 Respones to "Your Facebook Account Gets more Secure With Login Approvals"